Yesterday a lot of things felt more normal than they have in awhile. After work I set out for an easy 45 minute run- emphasis on the EASY. I finally paid attention to my heart rate again (something I have NOT been doing at all lately) and the whole run felt great. Yes, my pace was slow, but I’m not going to win this marathon. My goal is to finish and nothing I do in the next 18 days will make me faster but it can injure me, so it’s slow and steady from here on out. While I was pounding the pavement I got to thinking about what it will mean to me to finish this race and as I started to imagine crossing the finish line (which I can still barely fathom at this point) I was welling up! It was in that moment that I realize just how important all of this has been to me- and not just marathon training, this whole running journey I’ve been on for the past 2 years. The next 2.5 weeks are going to be all about this race- following the training plan, eating clean, sleeping well and running safe. I’ll be dropping my speed work and just getting the miles in without getting hurt. I’ll be paying attention to my average heart rate, not my average pace, and doing everything I can in to keep my legs feeling strong (including lots and lots of stretching, something I’m terrible at). So now for some running advice. Even though I am pretty sure I already know the answer I’ll pose it as a question: Do I stick to my training plan advised 10 miler this weekend or do I push it a bit further (maybe 13-15?) to try to toy with nutrition & hydration a bit more? Will those extra miles just be putting unneeded stress on my body? 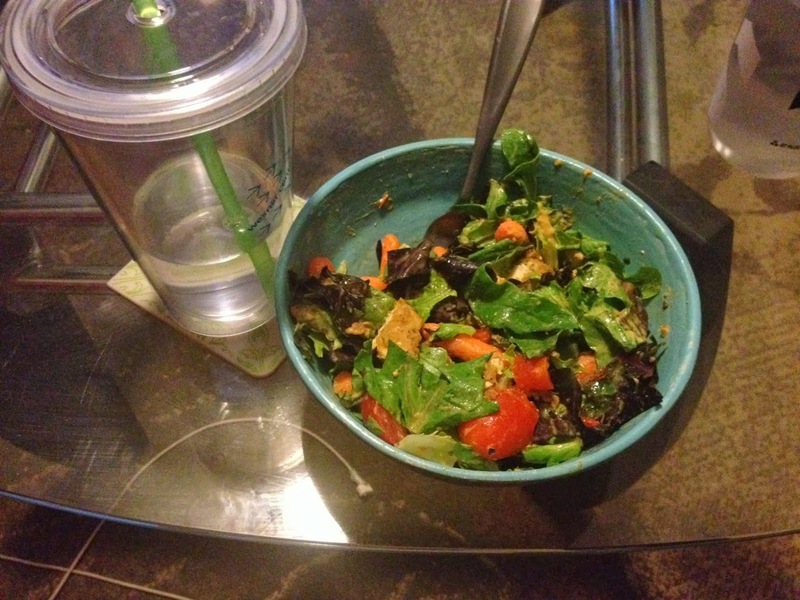 Post-run I sat down for a giant, if not completely unphotogenic, salad and many cups of water (I’m back to aiming for my 100oz per day). It’s embarrassing for me to admit that my eating habits have been way less than stellar recently. I don’t remember the last time I did a REAL grocery trip or made a meal that took longer than 10 minutes (which is plenty of time to create awesome things, I just haven’t been). There’s been a bit too much eating on the go/eating out and I just feel off because of all of it. I’m trying to snap myself out of it but I’ve really been struggling (and it doesn’t help when my favorite coffee shop has homemade pumpkin cream cheese! Yes, I had a bagel for breakfast). Tonight will be spent meal planning and grocery shopping, because I’ve got to put an end to this vicious cycle. Someone share some awesome fall recipe ideas, please. Even though it’s going to be 80 degrees today I can still embrace the fact that it’s October, right? This is NOT just cheap self-promotion… but today I posted a nice, easy, healthy soup that you need to try. You will need about 45 min to roast the vegetables but they require little attention. Nobody wants to taper as cleanly as we should. I'm sticking to my training plan to the minute during the taper. Don't go over 10. Also take in the entire moment when you get out there. This is the only time you get to run your first marathon. Mine came in 2009 and I can still tell you something about every single mile. Soak in the moment when it's here, and anticipate and appreciate how good you will feel at that finish line; it's a glorious accomplishment. One cool thing I did was carry a disposable camera (before cell cams got decent) and take a picture every mile either of myself or something cool on the course. They ended up being really cool pics. Good luck!